Have you ever tried to photograph a wedding reception? I now have a greater appreciation for those photographers who do this for a living. Yesterday I was blessed to be able to attend the joining in marriage of my 57 year old brother and his new bride. They met as teenagers at a summer camp more than 40 years ago and now their lives are joined together forever. 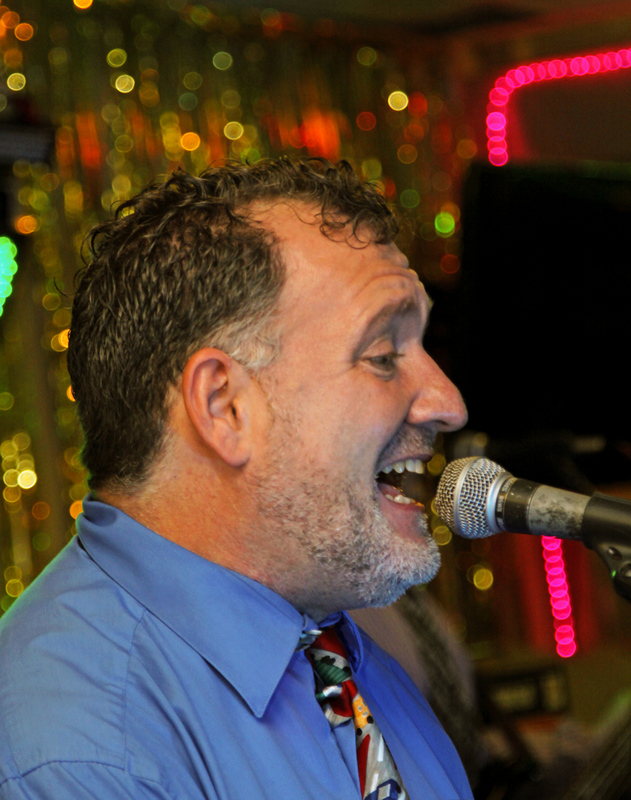 The wedding was a joyous celebration of family and friends. The food was great and there was live music too. The relatively dim lighting in the club meant that flash would be required for virtually all shots, and I did have an external flash with me, but I was using it for the first time. Throughout the reception, I ended up doing a lot of experimentation as I twisted and pointed the head in different directions to bounce the light. 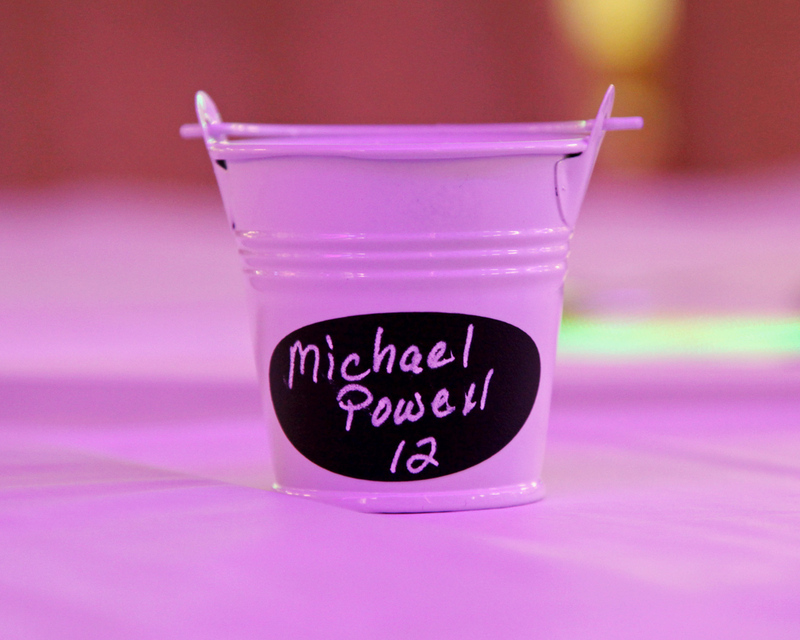 As I was getting seated at my table, I decided to take some test shots of the little white bucket that served as my seating card. 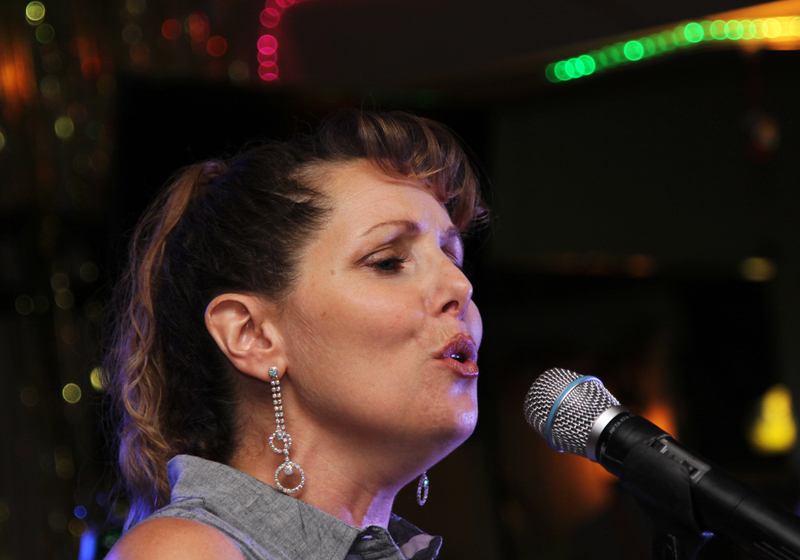 I was initially confused when I saw that all of my shots had a purple tinge to them. What was I doing wrong? One of my brothers helpfully pointed out that there was a purple light shining down on us from right behind where I was sitting. I quickly learned that uncluttered backgrounds were almost impossible to get and that composing shots of moving people in confined spaces is near impossible (and it’s even harder to get shots with decent expressions on their faces). There was a live band and I managed to get some decent shots of some of the band members, who were relatively stationary, though the constantly changing lighting made it a challenge. 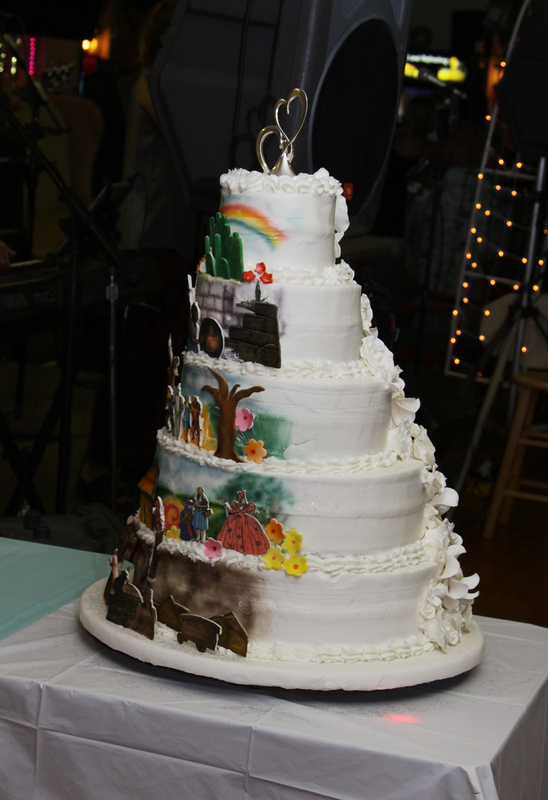 The groom has more than forty tattoos, including many of the characters of the Wizard of Oz, and the wedding cake featured numerous scenes from that wonderful movie. I did eventually manage to get some candid shots of people during the reception, but I haven’t yet decided if I will share them on this blog—I’ll probably check with the bride and groom to see what they think. What did I learn? Most of the “official” wedding shots probably need to be staged, preferably in an outdoor setting or a place where you can control lighting and background. The candid shots from the reception that look spontaneous and fun are really, really difficult to get and there are no guarantees that you will get good ones—you really do need a second shooter to increase the odds. Finally, it takes a lot of energy and stamina to take photos at a reception—I got a good workout doing all kinds of stretches and deep knee bends trying to get shots. 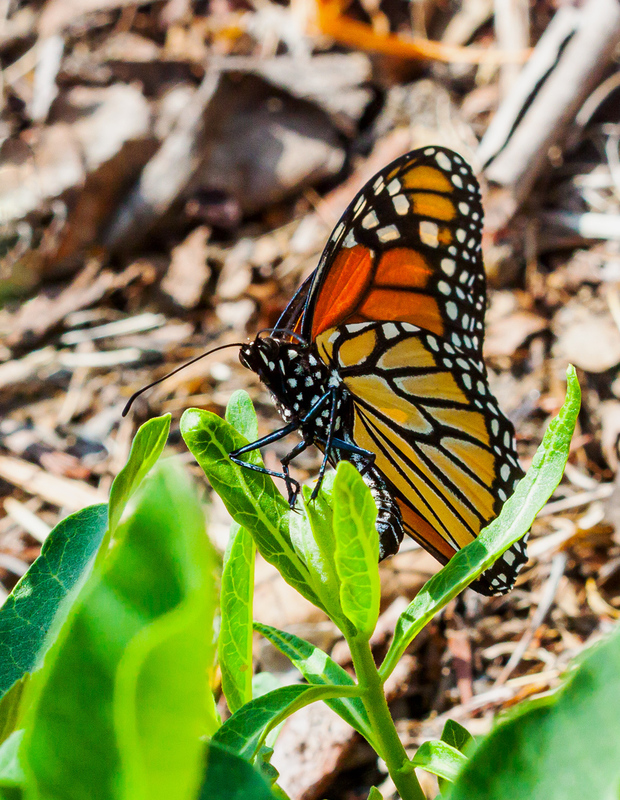 I was beginning to think that another year would go by without seeing a Monarch butterfly (Danaus plexippus) when yesterday I spotted one of them in the most unlikely of places—in the mulched plants at the back of the hotel where I am staying in Woburn, Massachusetts. After a grueling eleven-hour ride from Northern Virginia, I arrived at the hotel yesterday afternoon ready to relax. Unfortunately, I was told that my room would not be ready for at least an hour. I grabbed my camera and decided to walk around the grounds of the hotel, which is adjacent to a small canal, to see what there might be to photograph. 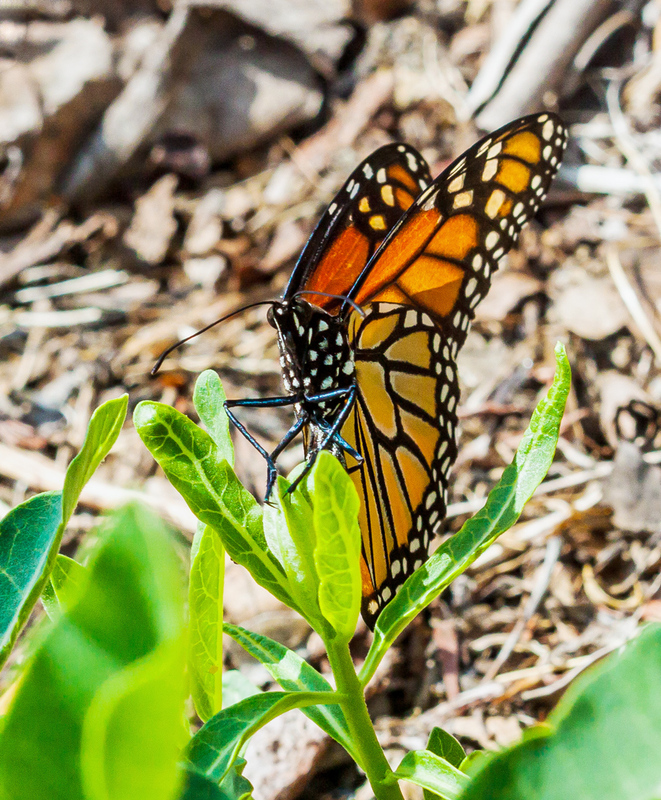 As I was walking, I caught sight of an orange-and-black butterfly that kept landing momentarily on the low plants, never staying still long enough for me to get a good shot (I was shooting with a 100mm macro lens). I kept chasing and eventually got some shots. It has been such a long time since I last saw a Monarch that any photo at all is a bonus, so it doesn’t bother me that these are far from being great shots. My excitement at seeing a Monarch is tempered a bit by the fact that I did not get the right angle to conclusively exclude the possibility that this is a Viceroy butterfly. If that were to turn out to be the case, I’ll be out again chasing butterflies in search of the first Monarch of the season. 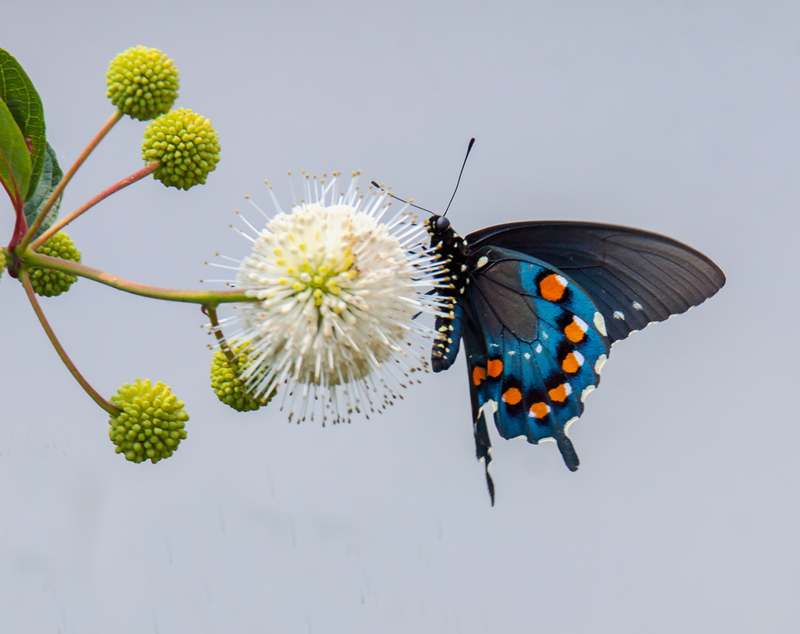 Butterflies were really active this past Monday at Huntley Meadows Park, especially around the buttonbushes (Cephalanthus occidentalis). A dark swallowtail butterfly caught my eye and my mind raced to remember how to distinguish among the various dark swallowtails. Fortunately I had enough presence of mind to capture some images, knowing I could search different resources when I got home. 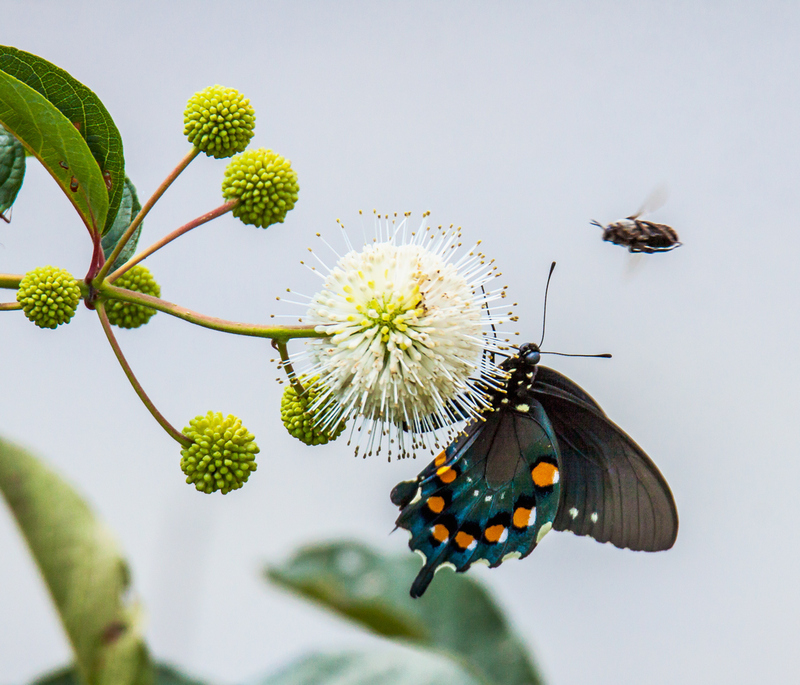 I’m pretty confident that the butterfly in question is a Pipevine Swallowtail (Battus philenor). One of its distinguishing characteristics is a single row of orange spots in the shape of a C. As I was searching the internet, I came across a wonderful posting by Louisana Naturalist that has side-by-side photos of four different dark swallowtails —the Black Swallowtail, the dark morph of the female Eastern Tiger Swallowtail, the Spicebush Swallowtail, and the Pipevine Swallowtail. As I was trying to get a shot of this butterfly, which was in constant motion, another insect decided to photobomb us. I think it is a bee and I am including a photo of the photobombing insect just for fun. 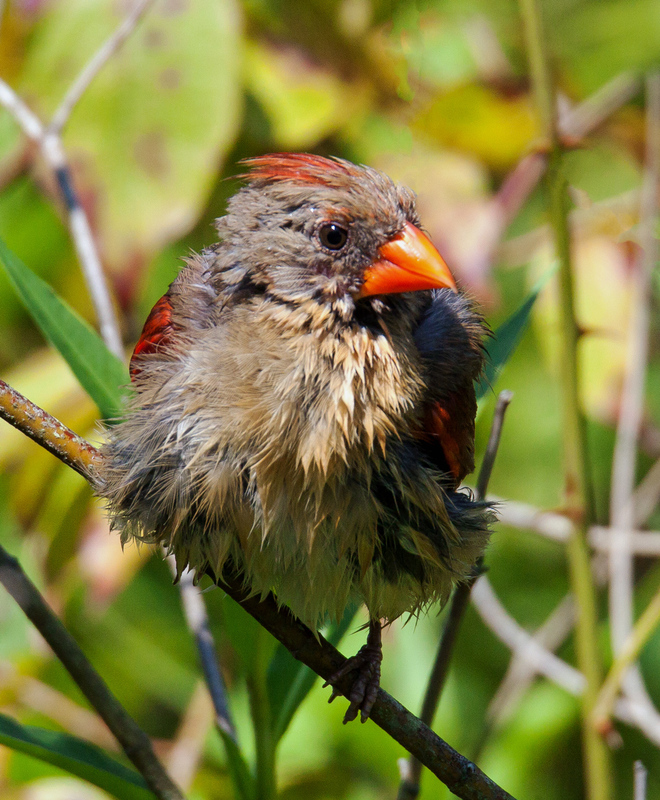 How do birds manage to survive the unbearable heat of summer? 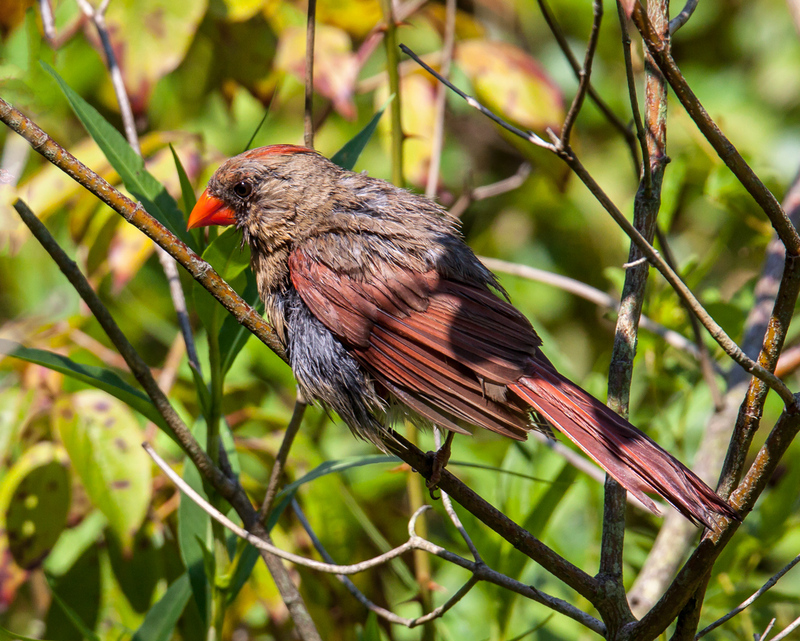 Monday, on a day when temperatures soared to 100 degrees (38 degrees C), I spotted this Northern Cardinal (Cardinalis cardinalis) at Huntley Meadows Park. It was sitting in the shade and looked like it had fluffed up its feathers or was drying off after a dip in the pond in an effort to stay cool. I was the crazy one standing in the sun. When the temperature is 96 degrees outside (about 36 degrees C), it’s hard to have the energy to go far with my camera. Fortunately, my neighbor, fellow photographer Cindy Dyer, has an awesome garden. 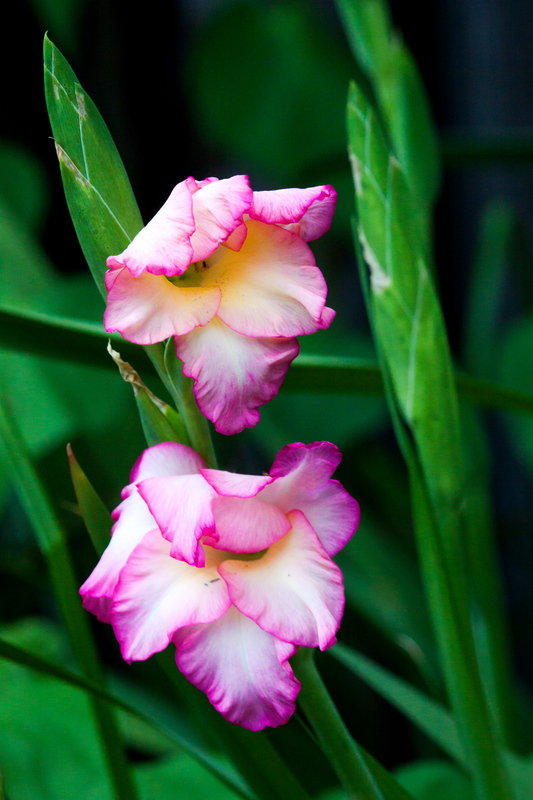 I was glad to be able to capture this shot of some gladiolas that were blooming there this past weekend. 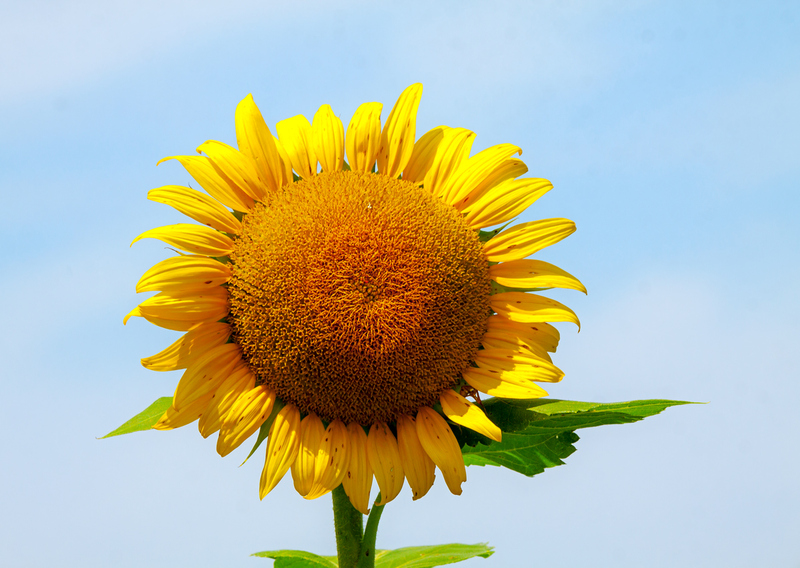 The bright colors and distinctive shape of sunflowers never fail to bring a smile to my face. 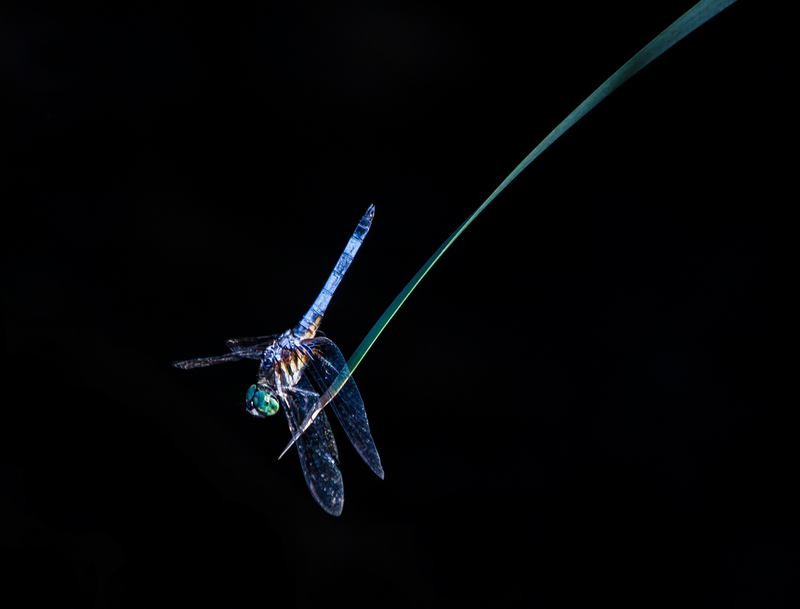 Here’s a shot of one from my trip last Friday to McKee-Beshers Wildlife Management Area in Poolesville, Maryland. Normally a shot like this is easy to get when the towering sunflowers reach tall into the sky. In reality, however, the sunflowers at this site were not that tall and I had to crouch low to the ground to capture this image. In addition, many of the sunflowers were a bit wilted and past their peak. One of my Facebook readers commented that it looked like the flowers had their heads bowed in prayer in the following shot, which gives you and idea of the conditions in one area of the field of sunflowers.